Everything you need to make the Life Resource and Retirement Planning System work is found on the homepage for the system (see the screenshot here). Below, we will go over each section of the homepage and briefly describe, for each tool in that section, what you receive for your monthly subscription. 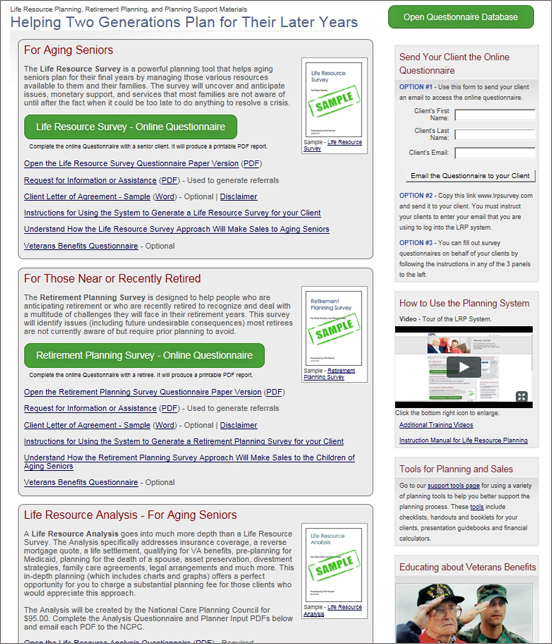 Tools in the Life Resource Survey Section Entitled "For Aging Seniors. The green button and the section called "Life Resource Survey - Online Questionnaire" leads to the online Life Resource Survey Questionnaire. You or your client can complete the questionnaire in two ways. The first way is to meet with a potential client and fill out the survey online during the meeting. This can be done on a desktop computer, laptop or a tablet. You then generate the survey and go over it on the computer, or you can print it out and go over it while you are meeting with the client. The second way to complete the online questionnaire is to send it to your potential client through an online login. The client can then can fill it out on their own. Use the section to the right called "Send Your Client the Online Questionnaire" to do this. Once an online questionnaire is filled out, even partially, it will save in your online database we provide you. You can save up to 30 questionnaires in your online database. By clicking on this image you can bring up a sample of the Life Resource Survey (PDF). This particular sample addresses all 29 issues that can be generated. This is so you can see what the report is capable of producing. This sample is not an example of a typical report. One that you would do typically, would produce about 10 or so issues that you can use as discussion points with your clients. You would typically email this paper version to a potential client. The questionnaire is a PDF form-fill document and clients can fill it out on their computers, save it on the computer and email it back to you as an attachment. Or a potential client can print the completed questionnaire and scan it or fax it to you. You will transfer the information from the paper version to the online questionnaire and produce a Life Resource Survey Report for your client. You would then meet with the client and go over the survey with that person. This form comes with our Successful Senior Marketing System, but we also furnish it to you here. It was designed to generate requests for planning from people attending our educational workshops. Over 175 mix-and-match slides covering 21 different topics are contained in the workshop portion of the SSM System. We felt this form would also be useful for you even if you don’t have the marketing portion of our sales tools. You can use it to generate requests for your planning services. Perhaps members of your network can use it to generate referrals for your planning. Or perhaps you can send it first to potential candidates for planning to generate an interest in your planning service. Or, you might be doing your own educational encounters and you can use this form to sign up attendees to meet with you. If you are interested In the Successful Senior Marketing System please call The National Care Planning Council at 800-989-8137 and we can explain how this valuable marketing tool can help you find potential candidates for the planning system. We include this sample letter of agreement for you to understand how we approach the planning with our own clients. You are welcome to modify this agreement as you see fit to use with your planning clients. We highly recommend that you use some form of agreement between you and a client if you are charging a fee. This is also important if you are in some way working with veterans and pointing them to their benefits. This particular document does not constitute legal advice and you should not consider the provisions in the document to necessarily pertain to what you are doing with your clients. It is meant as a sample only. Please consult with an attorney first if you decide to use this document. This 32 page instruction set goes into detail on how to use the entire Life Resource and Retirement Planning System. This is a PDF document. Images are included to help clarify many of the planning issues. Understand How the Life Resource Survey Approach Will Make Sales to Aging Seniors This article lays out the philosophy of our planning system and why we believe it works much better than a traditional sales approach. The article also touches briefly on the types of products or services that you can sell through using this system. About 1/3 of all individuals over age 65 in this country are veterans or surviving spouses of veterans. And about 20% of all individuals over age 65 could be considered war veterans or the surviving spouses of war veterans and would potentially qualify for the so-called aid and attendance Pension benefit. Both the Life Resource Survey Questionnaire and the Retirement Planning Survey Questionnaire have sections that will identify veterans and potential benefits. The National Care Planning Council provides a great deal of training and support for practitioners across the country who educate veterans and their survivors about VA benefits. At the NCPC we can also assist you – if you run across any senior veterans through your surveys that you do – by directing you to VA accredited specialists who can help those veterans get benefits. There are also a number of practitioners like you who work in the senior market but who understand veterans benefits and who focus on educating veterans. We designed this form for those practitioners who understand the benefits and who have a system to help those veterans or survivors. For those specializing in VA benefits, the approach here is to find out first if there is a veteran even before doing a survey. This one-page form is used to determine if there might be a benefit. The process is then started towards getting the benefit. Once that process is underway, the practitioner will do a Life Resource Survey or a Life Resource Analysis and complete the planning process with the client. Tools in the Retirement Planning Survey Section Entitled "for Those near or Recently Retired"
The green button and the section called "Retirement Planning Survey - Online Questionnaire" leads to the online Retirement Planning Survey questionnaire. You can complete the questionnaire in two ways. The first way is to meet with a potential client and fill out the survey online during the meeting. This can be done on a desktop computer, laptop or a tablet. You then generate the report and go over it on the computer, or you can print it out and go over it while you are meeting. By clicking on this image you can bring up a sample of a Retirement Planning Survey (PDF). This particular sample addresses all 22 issues that can be generated. This is so you can see what the report is capable of producing. This sample is not an example of a typical report. One that you would do typically would produce about 10 or so issues that you can use as discussion points with your clients. We have discussed the use of this paper version of the questionnaire above. You would typically email this paper version to a potential client. The questionnaire is a PDF form-fill document and clients can fill it out on their computers, save it on the computer and email it back to you as an attachment. Or a potential client can print the completed questionnaire and scan it or fax it to you. You will transfer the information from the paper version to the online questionnaire and produce a Retirement Planning Survey for your client. You would then meet with the client and go over the survey with that person. This 32 page instruction set goes into detail on how to use the entire Life Resource and Retirement Planning System. This is a PDF document. Images are included to help clarify many of the planning issues. Understand How the Retirement Planning Survey Approach Will Make Sales to the Children of Aging Seniors This article lays out the philosophy of our planning system and why we believe it works much better than a traditional sales approach. The article also touches briefly on the types of products or services that you can sell through using this system. These training videos provide detail on Life Resource Planning and provide information on how the planning system dovetails with the NCPC Successful Senior Marketing System. On this page, which is linked to the homepage of the planning system, we provide various tools to enhance and supplement your planning process. We provide you 31 online or Microsoft Excel calculators that are useful tools in helping you with the planning process. Most of these are directed towards retirement planning and provide analysis of such things as when to take Social Security, how to calculate retirement income, how to budget, how to pay off debt, how much IRA MRD’s will be and so forth. There is also a very powerful reverse mortgage calculator that will give you an exact quote including closing costs. The reverse mortgage can apply to either retirement planning or life resource planning. We provide you 4 different handouts or brochures that you can print and provide to your planning clients. These were written exclusively for you to use in the planning process. These documents also serve a second purpose. We intend for you to incorporate the documents into your planning reports. By doing so, you will impress your planning clients with the depth of your knowledge and with the amount of work that you have done to provide them with useful and valuable information. Instructions on how to incorporate these documents are found in the instruction manual on each of the 3 sections of the homepage. Even though each section indicates a different title for this instruction manual, when you actually download the PDF document the title is actually "Instructions for Using the Planning System to Generate a Planning Report for Your Client." These particular checklists and surveys are available as free documents online and we have captured them for you. They may or may not be useful to you in your retirement planning process. Our interpretation of the use of these documents is that you cannot use them if you are incorporating them into a planning fee. They are not intended for you to generate profit from their use.